Social media is a pervasive part of our lives – from how we connect with our family & friends to how we consume media. But is it for everyone? How about the macho, foul-mouthed crab fisherman who spend months in the frigid waters off the coast of Alaska? This panel, featuring captains from the popular Discovery Channel series “Deadliest Catch,” will look at the role of social media in the success and sustainability of the show. 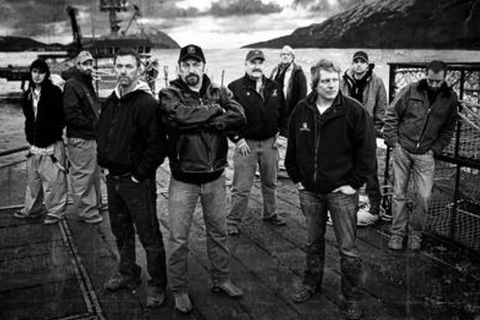 Whether creating special editions of shows in three days featuring fan commentary, adding live Tweets to premieres of the series’ “After the Catch” companion show or engaging with audiences across social media year-round, “Deadliest Catch” is the perfect example of how a social strategy can evolve with a nonfiction TV series and its real-world talent. Captains Sig, Johnathan and Keith will open up about their social media evolution – from naysayers to addicts – and how they directly engage with fans. With the self-confidence of a leader and the heart of a teddy bear, Johnathan Hillstrand runs a generally happy boat -- and a very tight ship. With the dangers posed by the Bering Sea, the safety of his crew has to be his chief concern. There is no room for mistakes when Johnathan is in the wheelhouse. Although a serious fisherman, John is also known as the practical joker onboard the Time Bandit. "Flour bombs," teetering buckets of water, and the unexpected detonation of a seal bomb or two are just a few of his favorite pranks! He'll also reveal from time to time a soft spot for wounded seabirds and other creatures. Like his brothers, Johnathan was born and raised in Alaska. Life at sea began at an early age; their father, John Sr., took them out on the boat just after they'd learned to walk. The Hillstrand brothers began fishing at the age of seven. Johnathan became a full-time fisherman after high school. He has not only been a crab fisherman, but for eight years, he professionally fished for lobster off the New England coast. When he's not crabbing in the winter, you'll find Johnathan fishing for salmon during the summer on board his 38-foot Fishing Fever. With so much fishing, Johnathan has little time for recreation. When he does get a break, Johnathan splits his time between Seattle and Homer,Alaska spending time with family and friends. Johnathan has two grown children, Tae and Scott, and two grandchildren. His favorite kind of fun -- riding a Harley Fatboy with an extra 300 horsepower -- has a thrill almost as sweet as a full pot of crab. More recently, he has also been outfitting a vintage muscle car to race against Andy. During Capt. Phil's last weeks and since his passing, Johnathan has been a source of counsel, advice and support for the two Harris boys. Joshua Weinberg is Vice President of Integrated Content Strategy, Innovation and Execution for Discovery. Weinberg conceives and directs partnerships between advertisers and Discovery content, spearheading unique integrations across on-air, digital and social platforms. He previously served as Discovery Channel’s Vice President of Communications, directing program publicity, managing the creation and implementation of press and public relations initiatives for series and specials and fostering collaboration and cross-pollination among marketing, production, research and development staffs to maximize network buzz and exposure, and increase ratings. Prior to Discovery, Weinberg served as Senior Account Executive at the boutique New York/Washington public relations firm – newsPRos. Before joining newsPRos, he was part of the launch team for BBC AMERICA, managing Press and PR for the network’s entertainment and news divisions. Weinberg began his communications career on Capitol Hill as Assistant Press Secretary to then Majority Leader, Representative Richard A. Gephardt (D-MO). Weinberg is a graduate of Northwestern University and holds a MSc, Media and Communications from the London School of Economics. A native Washingtonian, he is a past member of the Board of Governors for National Academy of Television Arts & Sciences (NATAS) National Capital Region. At the age of 22, Keith left behind his life as a Lake Tahoe ski bum to seek his fortune up north. He jumped on a plane with his best friend and landed in Kodiak, Alaska with no experience, a tent and $50. With only a hazy, but romantic vision of working at sea and the rumor of big paydays, Keith was determined to try something new and exciting. He started as a true greenhorn on the crabber Alaska Trader. Keith was instantly hooked by the fishing lifestyle and the camaraderie of being part of a crew working together against the elements. While initially looking only for adventure in Alaskan waters, Keith decided to make it a career. In 1988, three years after he arrived, he became a full-share deckhand on the Wizard. He earned his U. S. Coast Guard license in 1990 and moved from the deck to the pilothouse. Two years later, he received his masters (captain) license and has remained there as the skipper. He and his wife Florence have shared a special bond as partners in both life and business for more than 25 years. She manages much of the business end of their boat's operations and together they balance their time to raise their son Caelan and daughter Sienna. The son of a Norwegian fisherman, Sig began fishing at age 14. His father came from a long line of fishermen and was one of the first to develop the King Crab industry in Alaska. While still in high school, Sig served as a deckhand on a salmon gillnetter and joined his father aboard the family boat Northwestern which worked the crab fisheries in Alaskan waters. Sig also had a chance during some summers to return to his roots and fish in Norwegian waters. After finishing high school, Sig took up fishing full time, spending many months every year in Alaska. At the young age of 22, he was already enough of a veteran to serve as a "relief captain" on the Northwestern. Four years later, he became the boat's full-time captain and one of the youngest ever to take command. From his earliest years at the Northwestern's helm, Sig has known that his position in the captain's chair depends completely on results. Bring home the catch or go back to being a deckhand! Sig is a hard-driving captain who can push himself and his crew to work grueling hours under extreme conditions. Under that tough exterior, however, lies a fatherly and compassionate man who puts a premium on family responsibility. His wife, Juna, calls in weather reports (delivered in Norwegian!) and Sig keeps close to her and their three daughters back onshore. He extends his connection to family out to his crew; last year Sig kept deckhand Jake Anderson's slot open when Jake had to go ashore after his sister's death -- something other skippers might have refused to do. And this year, Sig will be training his brother Edgar to take over as captain of the Northwestern. For nearly two decades, Sig has seen to it that the Northwestern is one of the Alaskan crab industry's top producers. Sig considers this performance essential, but he'll tell you that a greater accomplishment by far is the lack of any major accidents onboard the Northwestern. The best captains bring home the catch -- and boat and crew -- safely.